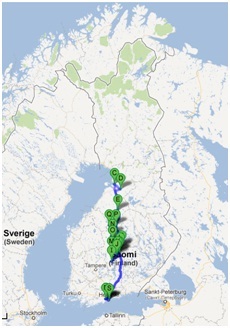 7 months, 7000km, 32 different places, 50 schools, 121 presentations and a lot of nature - Suomen Youth For Understanding ry. of -20 C or even less. even more trees and sometimes even a lake or a rock. speak English or any other foreign language. could go to so many other interesting countries. then gets over 20 degrees they complain that it is already to hot. meals per day and excessive coffee drinking also nothing unusual. I will never understand it completely. people I meet and the things I experienced. beautiful, monotonous and varied and all in all simply crazy!